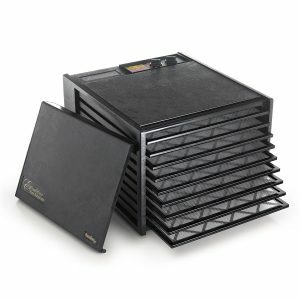 The Excalibur 3926TB food dehydrator has a powerful heating unit, good looks, and excellent reviews. Add to that its spacious interior, and this dehydrator is a nice choice for heating a lot of food at once. Reviews for the Excalibur 3926TB food dehydrator are jam-packed with high praise. Nearly all users are extremely satisfied with the product.Â This is especially true when comparing it to other dehydrators they used to own. Customers note the high heat capacity and spacious interior.Â These together make it ideal for dehydrating a lot of food at a time. Whereas reviews for other dehydrators often have a few complaints about slow cooking speeds, this dehydrator has none whatsoever. The few negative reviews point to various aspects of the machineâ€™s build. It is more susceptible to rattling and bending than other dehydrators made out of sturdier materials. It also gives off the impression of being less durable. However, most reviews concerning the quality of the dehydrated food it produces are positive, and the overall impression is that the dehydrator is worth its cost. It currently has an average rating of 4.6 out of 5 stars among nearly 1,300 reviews by Amazon customers. What Does the Excalibur 3926TB Come With? Besides the heating unit, the dehydrator is mostly made out of plastic-like material, which is considerably less sturdy than other dehydrators composed of metal. Over time, extensive use of the machine could slightly warp the material of the trays and the entire machine. This could consequence in a louder noise due to irregular vibrations. The nine drying trays are also composed of BPA-free plastic and safe to clean in the dishwasher. Though convenient, the drying trays may be susceptible to bending or sagging, although this should not really affect the quality of the food being dehydrated. Many of the features of the dehydrator are intended to simplify its use. It has an adjustable thermostat and a 26-hour timer, which is several hours longer than the timers on many other dehydrators. With a built-in on/off switch, you could allow the dehydrator to do its work for more than an entire day, without having to touch the machine after starting it. A notable missing element is a lack of a transparent door. You will not be able to see the dehydrating process in action or check up on foods you are cooking for the first time. The 9-tray model of the Excalibur 3926TB runs on 600 watts of drying power. There is also a smaller and cheaper 5-tray option that runs on 440 watts but is less commonly purchased. The fan, heating element, and thermostat are stationed at the rear of the machine and manage the dehydration process with a combination of finesse and power. 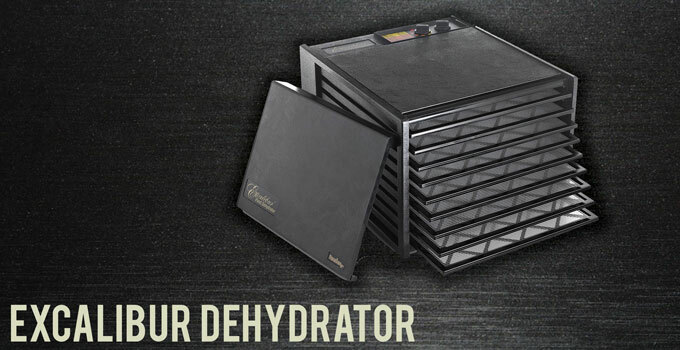 The heating is based on a patented technique known as Parallex Horizontal Airflow, which is exclusive to Excalibur dehydrators. During dehydration, cool air is sucked toward the back, heated, and then redistributed evenly throughout the entire machine. This method was designed not only to help dehydrate food rapidly, but also allow food to better retain its nutrients and taste without the need to take drying trays out or move them around. Since the fan and heating unit is at the back end of the dehydrator, it is important to make sure the machine does not have its rear jammed against a wall or otherwise blocked. This could hinder airflow and disrupt the dehydrating process. Another unique technology that this dehydrator employs is referred to as Hyperwave Fluctuation Technology. This keeps the temperature of the food being cooked low enough to maintain the activity of its own enzymes while also getting the air temperature high enough to effectively get rid of the moisture. Promoting both of these processes makes sure that the food becomes dehydrated without cultivating yeast, mold, or bacteria. Some cheap dehydrators emit a constant level of heat that can lead to case hardening, which risks trapping moisture inside of food and allow the food to spoil the slightest bit on the inside. The adjustable thermostat temperature control is also a bit different from other dehydrators. With a range of 105Â°F to 165Â°F, its minimum temperature exceeds 100Â°F, which is too high of a temperature for adequately dehydrating certain herbs and plants. Fortunately, the elevated heating range is ideal for preparing all kinds of other foods, especially meat. How Large is the Excalibur 3926TB? The Excalibur 3926TB measures 17 by 19 by 12.5 inches and weighs 22 pounds. It is a big dehydrator that takes up a lot of space and can be challenging to move around. Its bulkiness and the fact that its fan and heating unit are at the back means that choosing the right location to place it at really matters the first time around. With all nine of the drying trays at work, the dehydrator offers 15 square feet of total drying space. This is great for dehydrating food on a large-scale, and could be one of the better options for big families or people who plan on dehydrating a lot of food. Unlike in the case of smaller dehydrators, this machine has enough space for you to heat up food that needs space to rise by removing a few of the drying trays. You can use this dehydrator to rise bread, make yogurts, or even construct arts and crafts. The all-black exterior and rectangular shape gives the dehydrator a pretty inconspicuous design, apart from its large size. Being made mostly of plastic, however, the machine can feel a bit unstable or even cheap, considering its high price. Noise issues are not too much of a concern with this dehydrator. Like any convection oven or breeze-box fan, the dehydrator creates a whirring sound that can be described as white noise. People who do consider this type of noise disruptive should consider having it run far from quiet spaces. Some users appreciate the consistency of the background noise and do not mind just leaving it in the kitchen. The Excalibur 3926TB is on the higher end for food dehydrators, partly because of its capacious heating area and adjustable thermostat, but mostly because of its quality heating unit and airflow technology. Heating food at a higher range than most dehydrators, the machine seems to be geared toward dehydrating meat above all else. In effect, this machine might be the best dehydrator for jerky. One of the few potential drawbacks is that it is made mostly out of plastic material, which is uncharacteristic of kitchen appliances this large in size. But all in all, this machine is a prime option for dehydrating large quantities of meat.